GEORGETOWN, WILLEMSTAD – At the invitation of the Kingdom of the Netherlands, the Caribbean Community (CARICOM) is mounting a small Electoral Observer Mission to monitor the general elections to be held in Curaçao on April 28. Following elections on October 5, 2016, and after being in office for just over seven weeks, the Government of Curaçao led by Prime Minister Hensley Koeiman collapsed on February 12 when the coalition lost its majority. The Governor subsequently ratified the National Decree of the Koeiman Cabinet to dissolve Parliament and call for new elections. A four-member CARICOM Observer group headed by Dr Steve Surubally, former Chairman of the Guyana Elections Commission will arrive in Curaçao on April 25 and depart on April 30. For CARICOM, election observation serves as a platform to support existing democratic traditions within the Caribbean Community as part of its wider policy of supporting democracy. 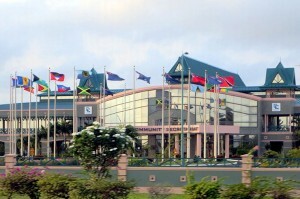 This is the first time CARICOM will be mounting an Electoral Observer Mission to a third state. Curacao’s application for Associated Membership in CARICOM is an interest CARICOM Heads of Government has recognized.